ADC firmly opposes the use and implementation of the inherently flawed Countering Violent Extremism (CVE) programs. CVE employs profiling to target and criminalize Arabs and Muslims. 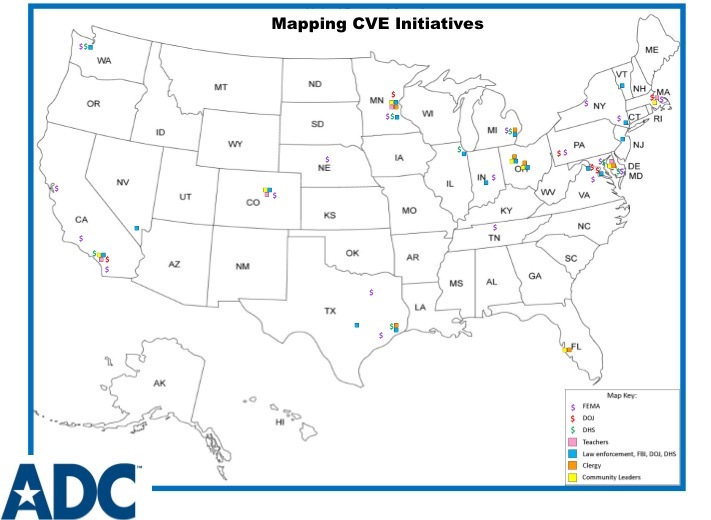 ADC produced a map of some CVE programs implemented and/or localities participating in CVE across the country.The implementation and/or use tools for CVE purposes in schools was reported by the survey to exist in 5 jurisdictions in the country: California, Colorado, Minnesota, Massachusetts, and Maryland. Noteworthy, is that three out of the five states (California, Minnesota, and Massachusetts) were the CVE pilot cities. The blue markers indicate the direct use of federal and local law enforcement in CVE. The orange markers indicate the participation of religious leaders and/or clergy in the CVE apparatus. The yellow markers indicate the participation of community leaders (such as sports coaches, counselors) in the CVE apparatus. As part of the CVE industry, mass amounts of funding have been granted through the U.S. Department of Justice ($), U.S. Department of Homeland Security ($), and Federal Emergency Management Agency ($) to civil society and private groups, education institutions, and law enforcement. Information incorporated into this map also includes reports from an survey of CVE in schools. The survey encompassed broad questions related to the use of CVE programs like “Don’t Be a Puppet Program” and Shared Responsibility Committees, recipient or sub-recipient of CVE related funding, and use of software, technology and internet monitoring programs. The survey was circulated to teacher unions, education associations, and afterschool programs. The pink markers indicate where CVE related programs were identified in schools. Respondents to the survey identified CVE related programs in elementary and secondary schools in the following states: California, Colorado, Maryland, Massachusetts, and Minnesota. Three out of the five: California, Massachusetts, and Minnesota are home to CVE pilot cities. *Map is subject to change and last updated 11/15/17. 2016 CVE Grantees that intend to operate nation-wide include Peace Catalyst International, National Governors Association Center for Best Practices, National Consortium for Advanced Policing, Tuesday’s Children. Further detailed breakdown of the CVE identified areas available here including 2016 CVE FEMA Grantees. A comparison of the location of CVE programs and/or participation in CVE reveals significant correlation of CVE programs in areas of the country with Middle Eastern ancestry populations. These correlations are based on 2015 U.S. Census data on the Middle Eastern population within these CVE areas.